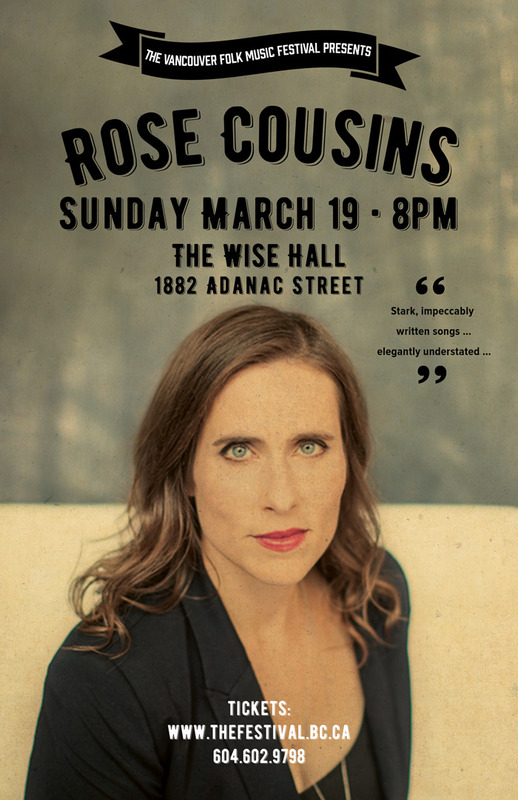 Driven by a voice that evokes raw emotion, Rose Cousins’ music bravely explores the shadowy corners of the heart. Just as her songs embrace sadness, pain, and longing, these emotions are counterbalanced in performance by quick, wry wit. A native of Prince Edward Island, she lives in Halifax, Nova Scotia. She's deeply fueled by collaboration and values being part of multiple music communities. Her 2012 album "We Have Made A Spark" won a JUNO Award, 3 East Coast Music Awards, a Canadian Folk Music Award, was nominated for the Polaris Music Prize, and made picks/best of lists in USA Today, NPR Music and Oprah Magazine. Her music has found its way into several TV shows including Grey's Anatomy. She will release her highly anticipated new album Natural Conclusion in February 2017 that was recorded with Grammy Award-Winning producer Joe Henry. Rose’s appearance at The Wise Hall will feature a full band and will be a very special evening that you won’t want to miss.